I’ve always known Actions were powerful tools but it took me a long time to figure out how to put them into my workflow. I figured it was a feature for Super Pro’s and I’d get there one day. Now I’ve learned that I can really speed up my workflow, even with some basic Actions. The other side of it is, knowing how to run or use your Actions. I’d look at the Actions Panel and I didn’t really know what I was looking at. I wasn’t confident that I was running them properly and now I know about Button Mode! 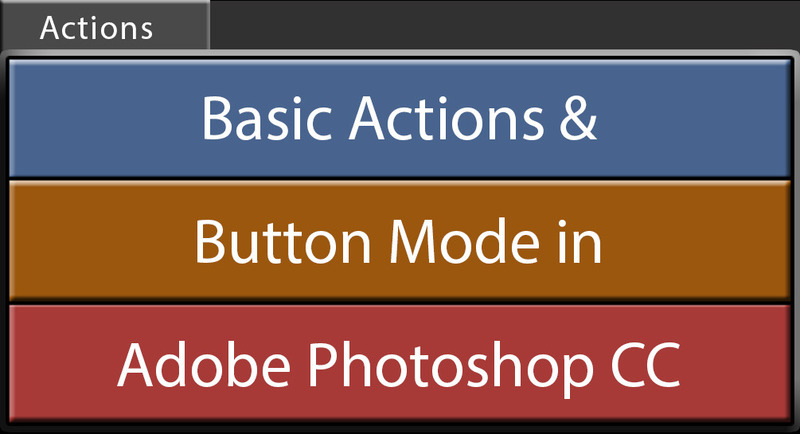 Controls in the Actions Panel. You have Stop, Record, and Play buttons. 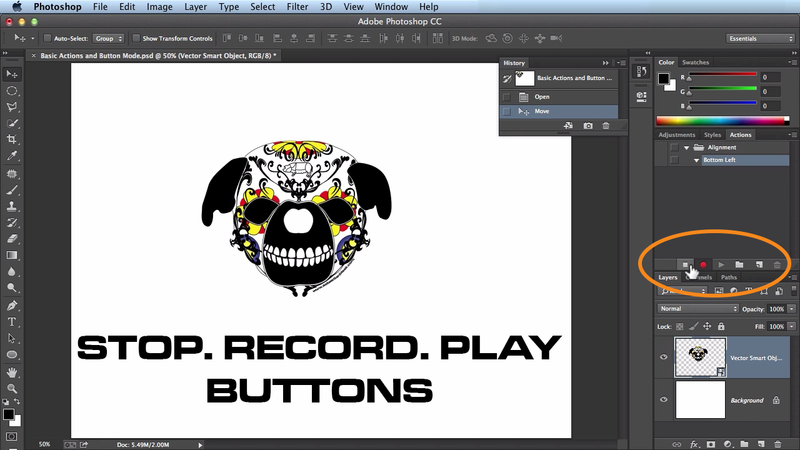 Use the basic Record, Stop, and Play buttons to create actions. It reminds me of using an old cassette player or a VCR. The big difference is that you do not have to be fast when you are recording your Actions because speed is not recorded. Photoshop will play back the Action as fast as possible. Each time I hit that Record button, I tend to feel this pressure to go fast and I can not explain why that is. I just remind myself that it’s more important to enter in my steps accurately. 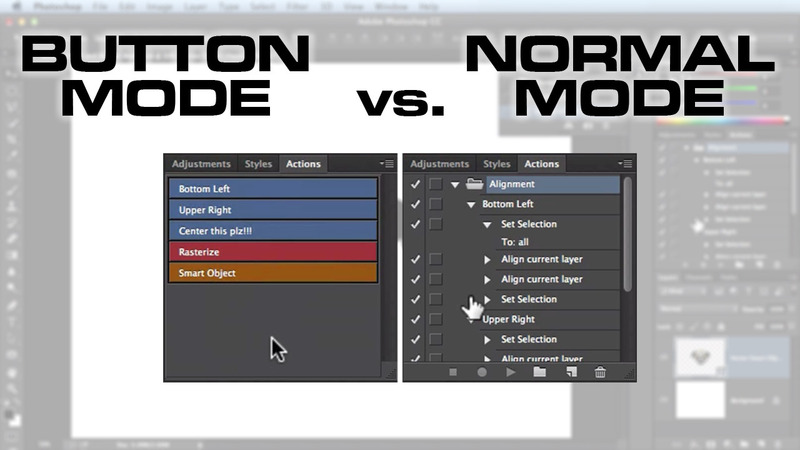 Above you see a side-by-side shot of Button vs. Normal Modes. The normal mode makes sense to me today but at first, it just looked like a bunch of letters and I’d cross my eyes and scratch my head. Now I keep my panel set to “Button Mode” because it simplifies the process. I can even colorize the buttons for a speedier workflow. All you do it hit the button and it runs your Action. HOW COOL IS THAT?!?!?! If you are making new Actions or editing old ones, you have to go back into Normal Mode. To really simplify things, I remove all of the actions from my panel and then create new ones as needed. It removes the clutter and allows you to find Actions you ACTUALLY use much faster. Besides, if you want to use the default Actions (I don’t) you can load them up really fast in the fly-out menu. Once you have some Actions you like, Save them in a location you can find later and you can load them again for future use. You do NOT have to save them in the location Photoshop is suggesting. If you can remember where that is, AWESOME. I still like saving mine in my own folder because I have my own system for organizing my files. Plus it makes it really easy to share with your mates! If you look up #NSL142 you should be able to follow my week, all of the videos I studied for this one, and other Tweets related to this post. Images looked best on FireFox when this post was created. This entry was posted in Never Stop Learning, NSL - Adobe Photoshop and tagged actions, adobe, adobe grind, adobe photoshop cc, adobegrind, bleek, button mode, graphic design, los angeles, never stop learning, photoshop, postaweek, sebastian bleak, sebastianbleak, tutorials, workflow. Bookmark the permalink. I’ve never built any action sets for Photoshop but I use them like crazy in Illustrator and am fond of triggering them with hot keys. One tip: if a recorded action just doesn’t seem to want to work you may need to insert the command manually using “Insert Item Menu” in the Actions option menu. Be warned though, some recorded actions sets just won’t work on playback and program updates can also render previously created action sets useless. PS if you really want to get nutty there are ways to trigger actions using Apple Automator.